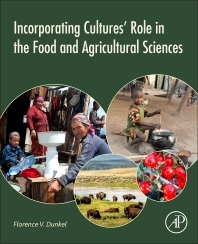 Incorporating Cultures' Role in the Food and Agricultural Sciences addresses the practical needs of the professors, administrators and students who often face challenges of working together with Indigenous peoples with whom they have no prior experience. Missed communication, failed projects and unrealistic goals are daily realities. Academia and industry often encounter frustration in recruiting and retaining Native American students and other ethnicities. This text is a guide for anyone working in the food or agriculture disciplines or industries, particularly for those working with people of a culture different from one’s own. Comprehensive, full awareness of one’s own culture is a prerequisite for effective teaching and learning within another culture. This book is replete with stories, examples and peer-refereed journal articles to help build awareness. These stories, examples and articles from multiple voices are placed over a basic underlying framework that is summed up in the title of the book itself. Food and Agriculture professionals creating training and educational tools for culturally diverse populations, Professors faced with developing culturally attuned curricula, those skeptical about this process and those who are curious about internationalizing their courses. It is also aimed at professors who have been successful in internationalization of their courses, but want to be more successful. Those teaching Anthropology of Food courses. Introduction. Grand Challenges and the Millennial Generation. Chapter 1. Quiet Revolution: Where did you come from? Chapter 8. Listening Between Communities and Policy Makers: Montana, Mali, and Mongolia Middle Schools Listen together with USDA NIFA and University Students. Chapter 11. Couples Counseling: Native Science and Western Science. Chapter 12. Putting it together, comprehensively, inclusively. Editor-in-chief of The Food Insects Newsletter since 1995; recipient of 1981 US National Academy of Sciences Visiting Scholar Award to People’s Republic of China; member of design team for state-of-the-art pre-departure training for US faculty, graduate students, and families to work on USAID food, storage, marketing project and live in Rwanda; author of 50 peer-refereed journal articles, 4 books and monographs, 2 patents; recipient of national and campus-wide awards for research, teaching, and service; principal investigator of numerous USDA and USAID, food, health, and agriculture related grants; presented 11 invited, food-related keynote addresses in US (e.g.,World Bank), Korea, Italy (FAO), Canada, Morocco, and the People’s Republic of China and a TEDx talk. Dunkel has worked with subsistence farmers in Asia, Africa, and Native American reservations for the past 33 years. She has also prepared and served insect feasts throughout the US including for more than 200 guests each at events in: San Francisco, California; Bozeman, Montana; and Charleston, South Carolina. Cultural aspects of food have been the topic of many TV appearances by Dunkel including PBS Evening News, Discovery Channel World of Wonder as well as radio interviews throughout the US, Canada, Australia, and the United Kingdom. Dr. Dunkel has initiated a pedagogy for food and agricultural sciences, the Expansive Collaborative Model, which she implemented in 2000 and taught every semester since. Dunkel has helped faculty adapt this pedagogy in several colleges at MSU and in other land grant institutions including a tribal college, and at a private urban university. This book demands our attention, requiring from us an absence of arrogance and requiring a humility to listen. It serves as a reminder of the patronising attitude that the 'educated' west brings with it when attempting to assist less developed societies.